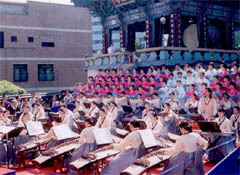 Buddhist choir and orchestra performs in Jogyesa Temple. Buddha's mercy reins on South Korea, as well, on the occasion of his 2548th birthday, which fell on May 26, 2004 in this part of the world. For celebration of his birth a variety of ceremonies and festivals were held at Buddhist temples throughout the country, where one-third of 46-million people believe in Buddhism. Jogyesa Temple (02-2011-1744-8) in downtown Seoul held special ceremony at its main hall of Daewungjeon at 10 a.m. on the day to celebrate the birth of Buddha and to wish that his mercy might spread throughout the world. All the Buddhist officials attended the year's biggest event. A festival followed the ceremony for thousands of guests gathered on stage in front of Daewungjeon. 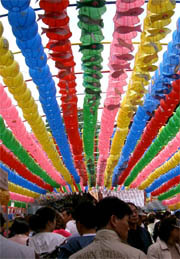 The festival started at 3 p.m. Jogyesa is the center of Jogye Order, the nation's largest sect of Buddhism. Some 5,000 participants included foreign dignitaries from foreign missions in Seoul, as well as government officials and political leaders. Tens of thousands of lanterns decorate Jogyesa Temple. The birth of Buddha was celebrated even in the Communist northern half of the Korean Peninsula. Estimated 500 Buddhist officials and lay believers gathered at Gwangbeopsa Temple in the North Korean capital of Pyeongyang on the day. The beauty of traditional lanterns were shown as well in the newly-developed upscale town of Gangnam south of Han River. Some 30 kinds of colorful images of Buddha and Buddhism were displayed at the entrance of Bongeunsa Temple (02-545-1448) in Samsung-dong, Ganganm-gu. "The Exhibition of Traditional Lanterns" held from May 21 to May 26 attracted both local residents and foreigner alike. Law enforcement authorities were lenient too, on the occasion of Buddhism's most important day. Justice Ministry released thousands of inmates in observance of Buddha's Birthday. 2,058 ``exemplary" inmates were pardoned by the government right before the national holiday. Some ceremonies were held in advance. 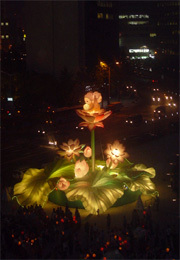 Nightly Seoul Sky was lit brightly with a variety of colorful lanterns bearing images of lotus, baby Buddha, and propitious legendary animal displayed in a lantern parade celebrating the coming 2548th Birthday of Buddha in downtown Chongno areas, on Sunday, May 23, 2004. 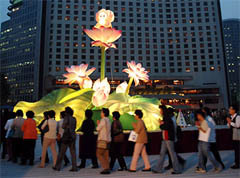 Lantern parade passes near City Hall Administration as part of Buddha's Birthday ceremonies. Hundreds of thousands of Buddhists marched from Dongdaemun (Big East Gate) Stadium to the Jogyesa Buddhist Temple. Hundreds of foreigners participated in the lantern festival. About 100,000 carefully-prepared lanterns of various kinds were carried along the street from Dongdaemun (Big East Gate) Stadium to Jogyesa Temple, making Seoul street a spectacular scene. Hundreds of huge lanterns baring the images of dragons, white elephants, Buddhas, and lotus flowers were displayed in the lantern parade. Unlike previous years, Buddhists from such Buddhist countries as Taiwan, India, Nepal, Thailand, Sri Lanka, and Mongolia participated in the festival, turning the Seoul lantern festival an international one. More than 10 million Korean people are believers of Buddhism, the largest religion in South Korea. Of particular interests to foreigners is "Itaewon Alley Festival," which was on May 26, 2004 behind Hamilton Hotel in Itaewon, the center of foreign communities in South Korea. The first "Itaewon Alley Festival" was presented by the owners and operators of the Alley area, djcj.org and the Itaewon Special Tourism Zone Association. Itaewon, the Koreas international melting pot, famous for its nighttime activities transformed itself to a community oriented area of fun, sounds and festivities. There were various events from live performances to raffle draw. There was also a grand Buddhist music concert on May 24, 2004 titled 'Buddhist music of Korea, Japan and China' at Sejong Center for Performing Art. Three renowned artists; Park Bum-Hoon of South Korea, Liu Wenjin of China, Anada Yassi of Japan put together a beautiful and serene Buddhist music. This extraordinary experience was credited as a high quality cultural event and was able to obtain major sponsorship from the Metropolitan government of Seoul. Mr. Yu Sae-Jin serves as staff reporter for The Seoul Times. He studied international relations, and covers foreign communities of diplomacy.